Currently in Santa Fe, New Mexico and naturally margaritas are a must. My friend Joy made a fabulous grapefruit margarita and I cannot get enough. I am usually not a fan of grapefruits either. They always seem to be too bitter and sour no matter how long I try to let them ripen up. But these were so simple and so incredibly delicious and refreshing. The days have been a tad warmer here too. The cold front is moving through tomorrow and I am welcoming it with open arms. Joy used St. Germain in this recipe too and I love love St. Germain. It was the perfect addition to these margaritas. And the Casamigos tequila is absolutely delicious. Plus George Clooney, ya know?! Fill a cocktail shaker halfway full of ice (I like the kind that you cap with a pint glass and shake). 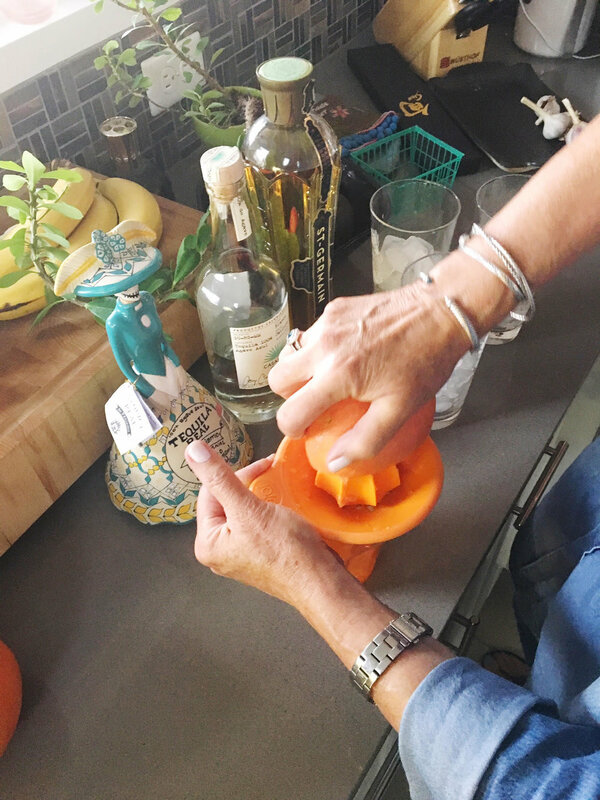 Add the tequila, St. Germain and lime juice (a jigger is helpful for measurements), and shake shake shake for at least 20-30 seconds. Strain into your rimmed glass, and top with grapefruit juice to fill glass/to taste. Garnish with a lime wedge, strawberry, and some fresh basil!